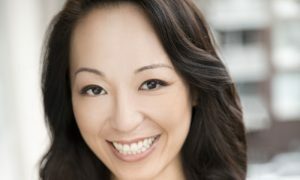 Have you ever considered earning a graduate degree in dance and wondered exactly what earning that degree would entail? Is there a specific job you are interested in that requires a graduate degree in dance? Dance Informa spoke with faculty from the graduate dance programs at California State University – Long Beach, The University of Arizona, New York University’s Tisch School of the Arts, and California Institute of the Arts to hear their insights about pursuing a graduate degree in dance. Why pursue a graduate degree in dance? Graduate degrees in dance (M.A., M.F.A., Ed.D., and Ph.D.) serve two primary functions. First, they provide space, resources and mentorship in support of the focused study of dance at an advanced level. In doing so, they provide individuals with an opportunity to revisit the discipline and their practice from new perspectives and with an attitude of inquiry in a supportive environment of intensive study and dialogue. Two, graduate study in dance prepares individuals for careers as dance educators and as contributors to the field of dance through choreography and scholarly research. – To enrich your creative process. You have the opportunity to bring your work, either as a choreographer or performer, to another level in a short amount of time. The resources that an M.F.A. program can bring make the process of working with dancers, procuring rehearsal space, and etc. easier. In addition, you are working within an environment with ample feedback and lots of contact with peers, artistic mentors, student colleagues as collaborators and future professional collaborators. – To perhaps fill in the gaps in knowledge, i.e. digital techniques (video, sound, etc. ), and to delve into the study of other theoretical concepts. – For some, to gain more experience as a performer (if the MFA program supports performance). – To gain experience in teaching and pedagogy to prepare for university/college jobs. A graduate degree in dance gives a dance artist an opportunity to spread their wings, attempt new avenues of engagement in the art of dance/choreography and discover new paths and methodologies that certainly can embellish the knowledge and expertise of the artist. Learning is a lifelong evolution, however intense focus for a few years on growing your knowledge and artistry can be accomplished while pursuing a graduate degree in dance. The M.A. (Masters of Arts) degree is traditionally 30 units while the M.F.A. (Masters of Fine Arts) degree is 60 units. Although every degree is a bit different with each program that offers it, generally a M.A. will require significant research, analysis and writing. With a M.F.A., that research/writing component is there, but the real emphasis is further development of your artistry as a performer and/or choreographer. 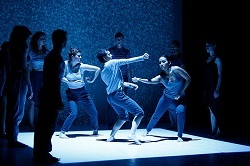 University of Arizona dance student Corey Campbell in ‘It’s A Jazz Thing’ choreographed by Michael Williams. Photo by Ed Flores. Dancers may pursue a graduate degree in dance because future teaching opportunities in the university environment require a minimum M.F.A. degree in many instances. A graduate degree allows artists to refine and research pedagogical and choreographic skills, develop fresh strategies for technical longevity and enhance performance artistry. Artists can also explore current dance and new media skills, supporting creative work and self-promotion. 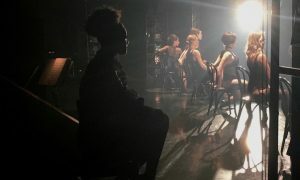 What post-graduation employment opportunities are uniquely available to dancers who have earned a graduate degree? No degree will guarantee employment. But, dance artists/educators that possess a multitude of skills, have had meaningful performance opportunities and exposure to multiple perspectives in dance training/education can utilize those while seeking employment. Graduate study enables a significant metamorphosis in all of these areas. Many college/university dance professor positions require a graduate degree, most often a terminal degree, which in dance is a M.F.A. The most common employment opportunity for M.F.A.’s is teaching, but an M.F.A. can prepare a dancer for any number of other professional settings: dance/arts administration, artistic/choreographic career for stage or digital realms, entrepreneurial areas both in the arts and outside. Tisch School of the Arts MFA students. Photo courtesy of NYU. Our M.F.A. alums are currently teaching in a variety of higher education settings across the country. We also have M.F.A. students working as artists/administrators (in company management), independent choreographers and artistic directors for big institutions. We have alums working in the field of digital arts/dance, directing dance for the camera works and earning a living through dance documentation and editing. Yuanyuan Wang, M.F.A., is the artistic director of the world touring Beijing Dance Theater, Jacques Heim is the artistic director of Diavolo Dance Theater, Laura Gorenstein Miller is the artistic director of Helios Dance Theater and Mary Ann Kellogg (one time member of Twyla Tharp) is now working extensively in the TV and film industry as a choreographer. Other M.F.A. graduates are teaching in college and universities on both coasts and in Europe and Asia. What skills, training and experiences make a good candidate for graduate study in dance? A good candidate is someone who has a few years of “real world” experience as a dance artist and can exhibit a portfolio of choreographic works created outside of an academic setting. We look for someone who is articulate about his or her artistic goals and needs, who brings a mature approach to art making and is intellectually curious and willing to dive into the intensive creative and learning environment that CalArts provides. A B.A. or B.F.A. in dance is usually a prerequisite for most graduate dance programs. However, always investigate that requirement. We, University of Arizona, have accepted dancers with other undergraduate degrees when that individual has a comprehensive dance background. That kind of student profile without a dance degree will often require some further course work to give appropriate foundations in things like dance history and kinesiology, for example. We look for graduate students who bring developed skills as a performer and/or choreographer to the table. Most importantly, potential candidates must show a true thirst for learning and be energized by it. They must be open minded to new thoughts, perspectives and ideas. This is the only way significant growth can result. Candidates must have life experience and professional-level performance experience –which naturally required a highly skilled dancer both technically and performatively. We look for generous, collaborative, respectful artists. Candidates must also have citizenship. The necessary skills, training and experiences for those entering graduate programs in dance depend, of course, on the degree pursued. The best M.F.A. 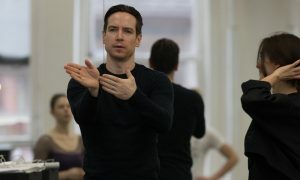 candidates possess an understanding of at least one technique at an advanced level and a solid training in choreography, with substantial knowledge and training in other technical systems and areas of dance study. In the program at CSU Long Beach, the ideal candidate will be skilled in both ballet and modern. In addition, the strongest candidates possess the desire to invest themselves in the intensive inquiry of dance as a practice with a focus in deepening their understanding of performance and choreography through not only physical training but also through additional research and knowledge of the interrelationships between dance and other disciplines. Top photo: Students in the Dance Department at New York University Tisch School of the Arts.